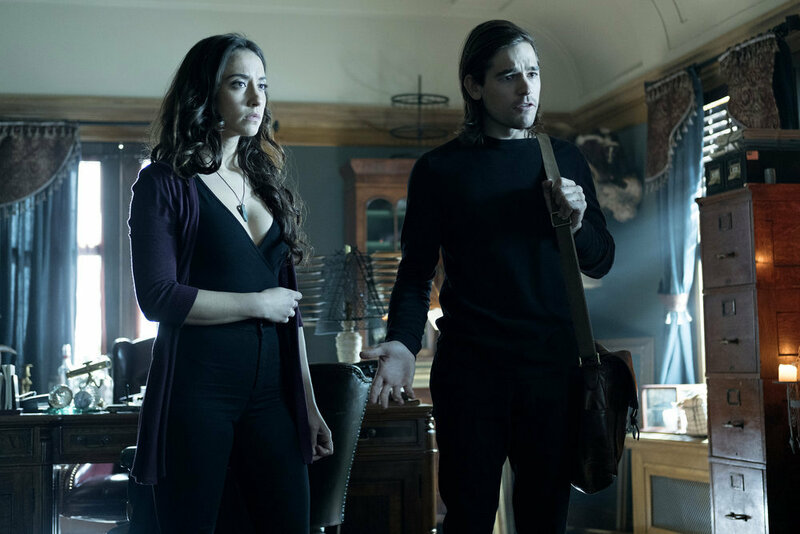 In the penultimate episode in season 2 of The Magicians, Quentin finally succeeds in his quest to bring Alice back from the dead and after he and Eliot meet a familiar god in their mission to save Fillory. Meanwhile Penny travels to the poison room with Sylvia his mentor and the hedge witches get a weapon to kill Reynard, but at a great cost. After retrieving Alice’s shade from the Underworld, Julia and Q manage to guilt trip Mayakovsky into helping them summon niffin Alice back to reunite her two halves together by using the magical batteries the teacher had been gathering. Unsurprisingly she’s severely pissed off upon returning to the corporeal world. That’s understandable being that she’s transcended human concerns. Q tries to reach out to her but keeps getting shut down and so she basically spends her time trying to write down everything she remembered about magic as a niffin before it fades from her mind. In the meantime, Eliot asks for Q’s help in getting him back to Fillory after his sudden banishment. Together they figure out a into the other world via the first portal hinted by the dragon in last week’s episode. Quentin remembers that he saw an old grandfather clock that looked just like the one from the books inside the house of the magician who was supposed to conduct his Brakebills interview but died (leading Jane Chatwin to intervene). 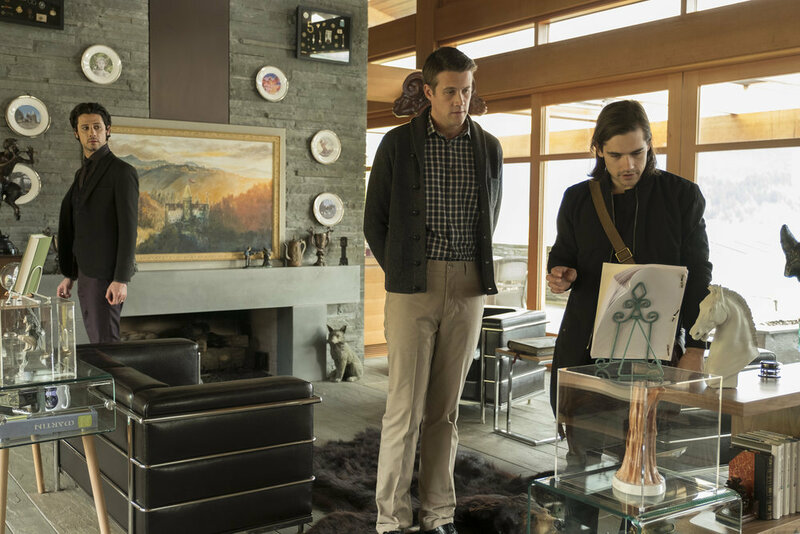 The two are able to track down the clock through an auction website (they bribed the webmaster into revealing the purchaser’s address) to a residence in Vancouver. Q’s inner nerd saves the day when he recognizes a fellow collector in the owner and they bond over Fillory. Inside the home is a ton of memorabilia and collectors items all relating to the books. Quentin spots a scrapped screenplay and tentatively asks if he can read through it. The other man gives him permission and ends up mentioning that Jane was the Watcherwoman and Q catches that was never mentioned in the stories. The mysterious collector tries to backtrack but Eliot casts a quick spell and sees that he actually has horns like Ember. Sighing heavily, the other man snaps his fingers and reveals his true form and Quentin recognizes him as Umber, the other ram god of Fillory. Supposedly Martin had killed Umber, but in truth he made a deal with the Beast, faked his death, and then left Fillory to live in Vancouver because obviously that’s the next best thing. He’s then spent his time working on a new pocket world in the shape of a cube that he calls Cuba. Umber explains that without him chaos is descending upon the other world because he balanced his brother out. The difference between the two brothers are noticeable as Ember is a wilder creature fond of excess in all things, while Umber wears buttons ups and khakis. He questions Eliot and Quentin about Fillory as if they are in a focus group so that he can make updates to Cuba. The ram god also fills them in that his brother is likely growing tired of the game they created in Fillory and will soon destroy it out of boredom. He confirms that Ember had wanted to turn humans into rats (which happened in last episode). Eliot makes an impassioned plea to Umber that even if he won’t go back to save the place he helped create that he should at least let them try. Eventually the magical being relents because he sees that the High King truly loves Fillory as well and gives them the grandfather clock. Speaking of clocks, time is running out for Julia and Kady to kill Reynard. They haven’t got much of a lead at the moment since they don’t have the energy to take out a god nor the spell to be able to do some intense battle magic. John (the demigod and senator) suddenly comes back to Brakebills though and lets the two women know that his father seems to be obsessed with Our Lady Underground aka Persephone. Julia comes up with the plan that they just need to lure the fox god into a trap by thinking that the goddess is on Earth. However Reynard confronts his son after, knowing that he’s gone to speak to the witches and as punishment killed John’s wife. This only pushes the senator returns further from his father and he returns to the magical school and makes Kady perform the ceremony to harvest his power and killing him in the process. He couldn’t make Julia do it after everything that she’d been through (he coerces her to go out for pizza). John’s sacrifice results into one god piercing bullet. They are able to get the spell for it thanks to Penny who finds the Poison Room through the help of Sylvia. She figures out that they just need to find a specific fountain with books that is the main door to the restricted content section. Sylvia is also able to break the wards put on the fountain and she ties a rope around herself before jumping in with Penny going after. Beforehand though she claims that she wants to see her book because something wonky is severely going (the book of every person currently alive is missing the last 20 pages). 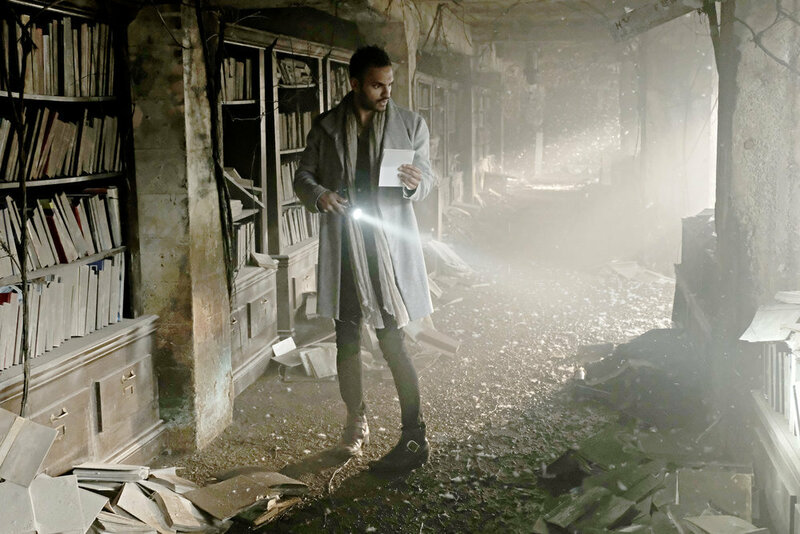 Apparently the librarians have known about it for awhile, but have no idea what is going to cause it, only that it’s going to be a catastrophic event happening in a few weeks time. Penny finds “The Art of Killing Gods” after some time and unfortunately instantly gets boils on his skin upon touching the book. He runs to get Sylvia who looks horribly sick already. She tells him to get out of there because she isn’t going to make it and his only chance to survive is if he leaves her. We don’t find out if she somehow survives, but in the next moment Penny’s travelled back to Brakebills and gives the book to Kady before collapsing. He’s taken to the infirmary and hopefully will make it through to the end of the season! As a distraction, Julia invites Kady to go hunt Reynard with her and they set up a trap for the god. They summon a massive storm and soon enough the trickster appears and just as Julia is about to shoot him with the bullet containing John’s energy, time stops and Persephone appears. The hedge witch confronts the goddess and asks why she’s appeared now. Persephone implores her to spare Reynard’s life because he isn’t her former lover but her son. Say what??? So the fox god is angry that his mother abandoned him. Julia is still beyond livid and asks her if she knew what he did because not only did she get raped, she also lost all her friends and her own shade during the exorcism. Persephone says that there are consequences to killing a god and that Julia shouldn’t let him take away her compassion as well. Realizing that the goddess was right, the hedge witch puts the gun down and the two magical beings vanish after the mother tells her child that she’s back and so disappointed in him. Kady is understandably pissed as all hell since she had personally been forced to kill John in order to destroy his father. As the other hedge witch walks away, a familiar figure emerges to greet Julia. It’s her shade! Looks like Persephone sent her from the Underworld as compensation. So far throughout the season we’ve seen a ton of continued character growth all around. Margo had finally accepted responsibility for her actions by going after Fen into the fairy world after seeing how upset Eliot was. Eliot in the meantime actually wants to fix Fillory even though Ember gave him an out by banishing him. He’s starting to act like a real king. Penny opened his heart and put someone else’s interest before his own. Kady didn’t run away this time and stuck it out to help Julia even though the odds were against them. Though Quentin wallowed in self-pity for awhile after Alice’s death, he finally made better use of his time by helping Julia get her shade back and in turn she aided him in resurrecting Alice. Alice was a less selfish person to start with and so seeing her change into a more sinister and self-serving character was so much fun to watch. With the season two finale next week will Eliot be able to save Fillory? Will Margo and Josh rescue Fen and her baby? Will Alice finally forgive Q for bringing her back? Will Penny survive the poison room and how will Julia deal with getting her shade back? We’ll find out soon enough. 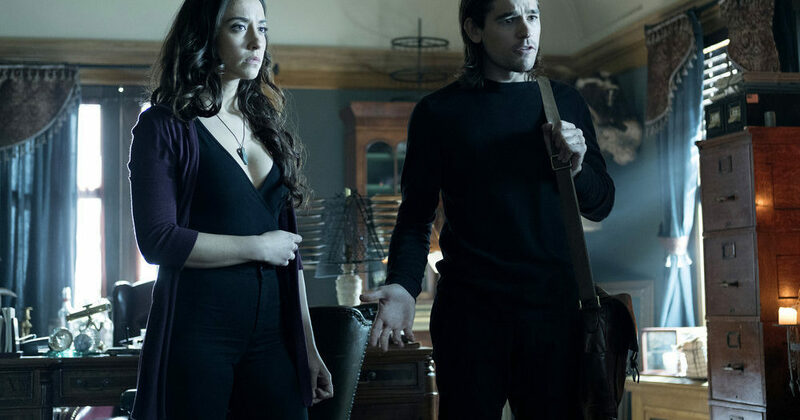 The Magicians is on Syfy Wednesdays at 9/8 central.